MIAMI BEACH, FLORIDA (The Nil Admirari) - Citing his "commitment to both sound science and the healthy debate on the existence of climate change" the presidential campaign of U.S. Senator Marco Rubio (R-F.L.) announced the candidate will set up his campaign headquarters in a part of Miami Beach that is always flooded. The announcement comes two days after Rubio bravely voiced his denial of man-made climate change, a move political strategists say the senator has brilliantly reinforced with his decision on where his campaign headquarters will be. "The senator will not be seen as a man who listens to the overwhelming majority of scientists over the loud, strongly held beliefs of conservative Republican primary voters," stated Rubio 2016 Spokesperson Renee Krieger, whose legs and the podium they stood behind were being lapped by gentle waves in the three foot deep pool of the first floor of Rubio 2016 Campaign Headquarters. "And what better place to do that than here in a building that sits right off beautiful Miami Beach," Kieger continued, seemingly unnerved by the increasing water level brought about by high tide. Krieger was thanking the press for coming when Rubio emerged from a back office following a brief struggle with the water current for control of the door. The presidential hopeful smiled uncomfortably at the press as the door he fought so hard to open was slammed shut behind him by the same adversarial current. Rubio seemingly looked at Krieger for help, but she just shrugged at him so he swashed his way to the podium. The senator's brown dress pants were thoroughly drenched at least up to where many in the press pool disturbingly posited his almost certainly shrunken testicles were most likely to be in the air conditioned building. "I hope you can all appreciate the boldness of this location for my campaign headquarters," said a smiling Rubio, who puckered his face in what was later understood as an attempt to get some saliva flowing. His failure to do so was followed by the senator producing an empty glass from behind the podium and bending to his left side as he used the vessel to scoop up and savor some refreshing Atlantic sea water. "Because all of this climate change nonsense is nothing more than people with facts claiming the sky is falling," continued a refreshed Rubio. He placed his now half-full glass on a nearby desk. "Except, of course, it is the ocean rising that scientists and liberals are using to fear monger and scare Americans with their unimpeachable data and outrageously accurate forecasts." "As in the debate between evolution and creationism, the scientific community is also deeply divided about the existence of man-made climate change and its impact on our great nation," Rubio stated, skillfully changing the definition of the term deeply divided by referencing a debate in which well over 90% of scientists fall into one of the two camps. 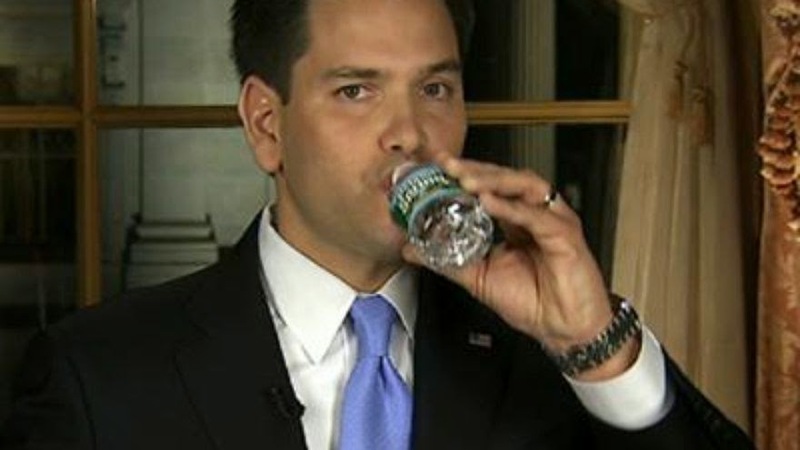 Rubio skillfully ignored a swarm of questions from the press by quickly utilizing his freshly-lubricated mouth. "I say Americans should hear both sides and be taught the controversy between the fact-wielders and the True Americans who mistrust experts because their gut tells them so." The senator abruptly cut the impromptu briefing short and said he had to go open the windows in his office before the tide came in. Although Rubio said he would not take any questions one reporter's inquiry caught his attention and he turned to face the press for one last exchange. "Yes. There absolutely is a water slide in the day care for the children of my campaign staff. Our children need to learn they have nothing to fear from the ocean's attempt to hug America a little closer, or from a surplus of water in general - a surplus other areas of our great country would love to have. That's why there aren't any life guards on duty - well, that and freedom."